Two posts back I summarised the key discoveries of an inquiry into the relation between designing and implementing inside healthy permaculture design process (starting here). In the last post I shared a podcast with Ben Falk in which we chatted about this relation (as well as a bunch of other stuff). 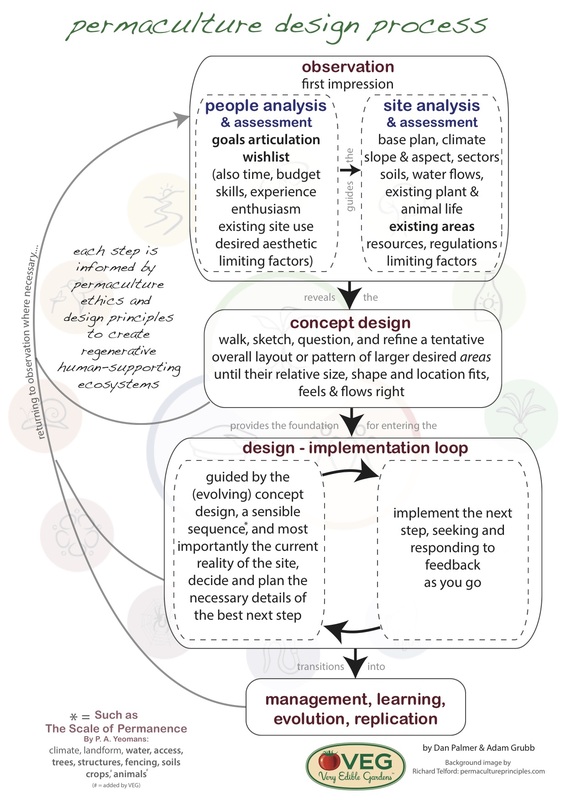 In the next couple of posts I want to share a few examples of how a couple of different permaculture designers have responded to or adapted some of the outcomes of this inquiry into their own design process understandings, models, or diagrams. I would love to hear from others about this too. The way I see it, either you already had something quite different to what is available in the existing permaculture design literature, or, if the conclusions of this inquiry have any validity, a wee bit of revision is in order! In this post I’ll share an example from the permaculture design firm I run with my friend Adam Grubb. We call it VEG or Very Edible Gardens. In the next post I’ll share an example from some colleagues who run Resilio Studio over in New Zealand. Then, if you’d care to submit something, perhaps in the next post I’ll share your take. Okay, let’s look at VEG’s example. …which we were most proud of, and used to train quite a few workshop participants. Yet in the terms of the foregoing inquiry, just like all the other examples I have reviewed, this is a clean example of fabricating, in which designing up to a detailed level precedes implementation. As the results of this inquiry started to illuminate crippling deficiencies with fabricating as an appropriate approach to permaculture design, I realised that things had to change. The above diagram just didn’t sit right no more. It felt like I was misleading people if I suggested this was the most effective way to go about organising one’s process. Furthermore, it was losing its correlation with my own processes of designing and developing, both personally and professionally. …so that it at least now reflects what I’ve been calling a hybrid process (if not going as far as fully fledged generating). In a hybrid process, you get as far as a concept design before launching into implementation and let all the detail emerge from an iterative dance between reflecting, acting, and evaluating. Head, hand, and heart, all moving forward together. See an example here. Personally I’m only just edging into the territory of feeling comfortable of bringing fresh designers straight into a fully generative process.3 I’m there with my own process, but in terms of an on-ramp for others, the above diagram is about as far as I’ve pushed it. But I can feel a completely fresh diagram emerging, starting from scratch rather than trying to retrofit what started out as yet another linear fabricating sequence, with the addition of more and more little feedback arrows trying helplessly to hold it all together. More on that in due course, no doubt. Anyways, that’s it folks – one example of translating the outcomes of this inquiry into our work as designers and design educators. In the next post I’ll share another example. Meantime, a good day to you. ps. 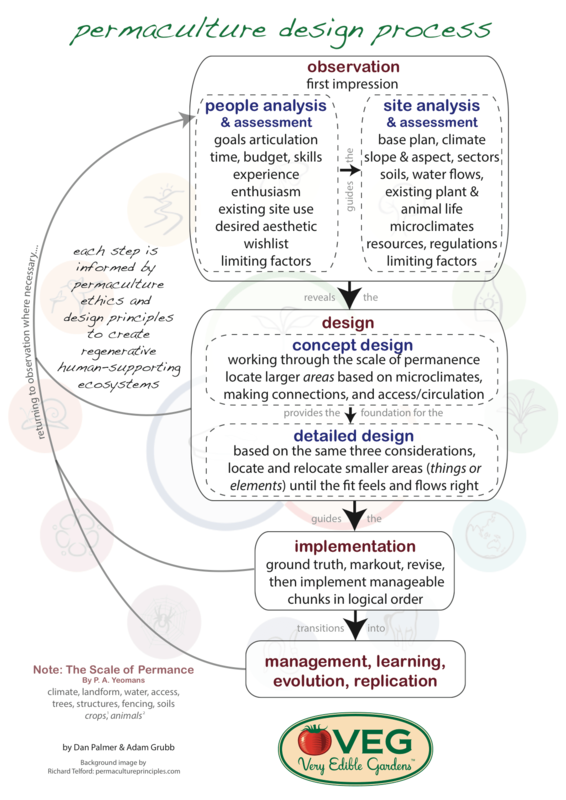 Again, if you also care to share your current best effort at a diagrammatic summary of your take on sound permaculture design process, then right about now is a particularly good time to give me a nudge. I mean I’ve just shown you mine, right? Surely a little reciprocation is in order? More broadly, I’d be thrilled if this site became some kind of sharing place where permaculture design educators from around the world could share and co-evolve design process understandings. Permaculture’s lone wolf era is over, people, let’s catch up with the times here! Any ideas on how this might be facilitated (and in particular anyone with energy to help make it so) are welcome!